Cambodian street food is not as famous as its counterpart Thailand. The cuisine, in general, is overshadowed by its popular neighbors Thailand and Vietnam. However, once you go deep into Cambodian cuisine, you will discover unique and amazing flavors. Cambodian street food offers unique and surprising delicacies that are foreign to the eyes and stomachs of most visitors. It is not for the squeamish travelers. That said, street food in Cambodia, from Phnom Penh to Siem Reap, will give you an amazing experience, a real culinary adventure. As you dive deeper into the Khmer street food culture, you will find rare treats and wonderful delicacies. Take a look at our top 10 list of Cambodian street food, and get ready for some surprising finds! Lort cha is one of the most popular Cambodian street food. It is a stir-fried dish consisting of Lort which are short fat rice noodles, with bean sprouts, Chinese broccoli, and chives. It is typically cooked with beef and topped with a fried egg. The dish is served with a thick red sauce which is sweet and spicy. And if you want more spice, you can add red chilies to your meal. You can find Lort cha vendors on the streets or at the markets in Phnom Penh or Siem Reap. 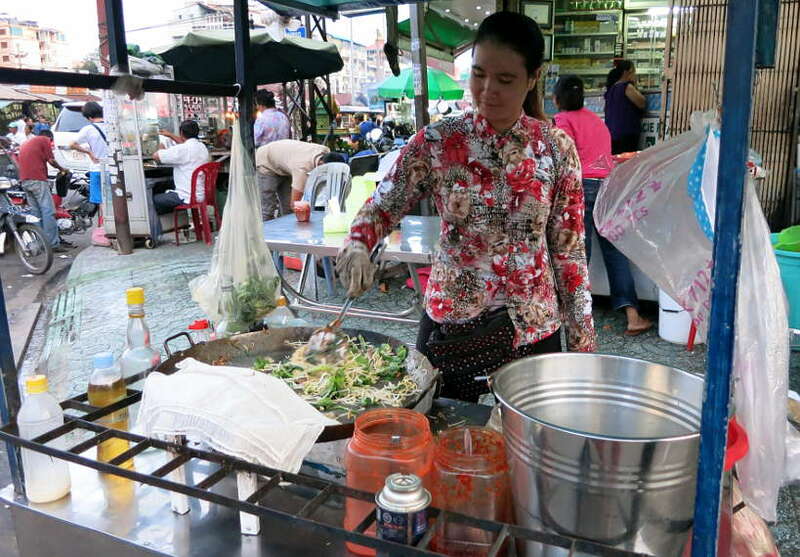 Lort cha is typically prepared on food cart with a large stir-fried pan. We had this dish several times in Cambodia and enjoyed it best at the local markets. It is easy to spot the vendor as you see them cooking in real-time. Look for vendors where locals are eating or stopping by for takeaway. This is a sign of good and safe food and of our tips for eating local and safely on the streets. It is a very tasty dish, with a nice amount of vegetables and a great mix of protein. A definitely must try in Cambodia! 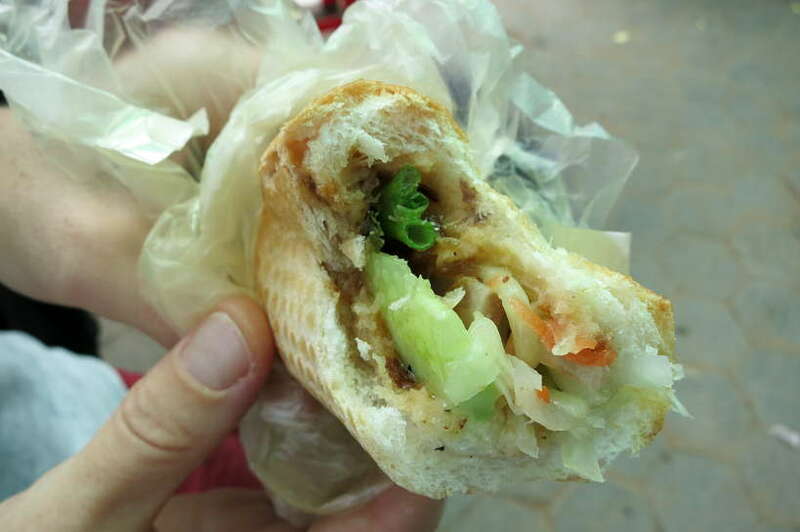 You will quickly recognize this familiar Vietnamese ingredient in Cambodia: the baguette. Brought by the French during the Indochina colonization period, Cambodia calls it Num pang. This sandwich is typically served with meaty ingredients such as pate, ham or pork served with cucumber, carrots, chives and onions. You will find Num pang street vendors with their carts outside of markets or near office buildings. The are easily identifiable with the baguettes exposed on the carts. If you want to try a modern twist on this classic sandwich, Nompang, a newly opened chain in Phnom Penh, offers an interesting variety of the sandwiches. 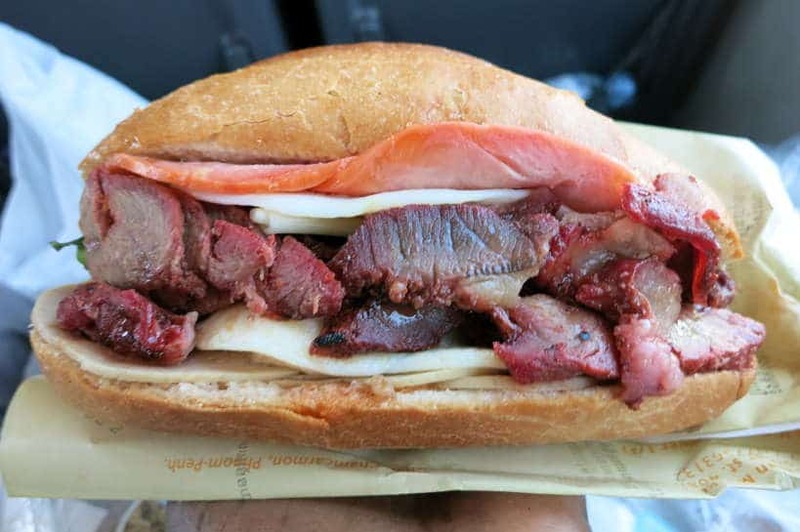 We recommend the Classic which consists of red pork and ham. Made with quality ingredients, it is excellent and quite filling! They have several locations in Phnom Penh. The one we went to is listed below. In Siem Reap, we recommend the local market called Pho Langka Market. 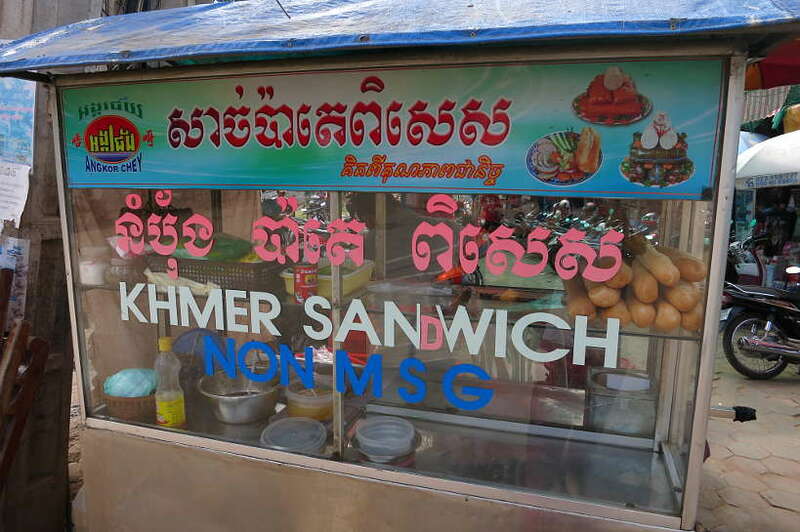 You will find one dedicated vendor of the Khmer sandwiches. We had the classic pâté sandwich, which we immediately enjoyed. Tasty with a slightly sweet and sour hint of flavors. Address: Along Siem Reap River in the north part of town. Bamboo sticky rice, known as Kralan in Khmer, is a type of sticky rice roasted in bamboo sticks. It is made of sticky rice mixed with black beans grated coconut and coconut milk. The mixture is packed into a bamboo stick and slowly roasted over a charcoal fire until cooked. We first discovered bamboo sticky rice in Thailand and really enjoyed it. 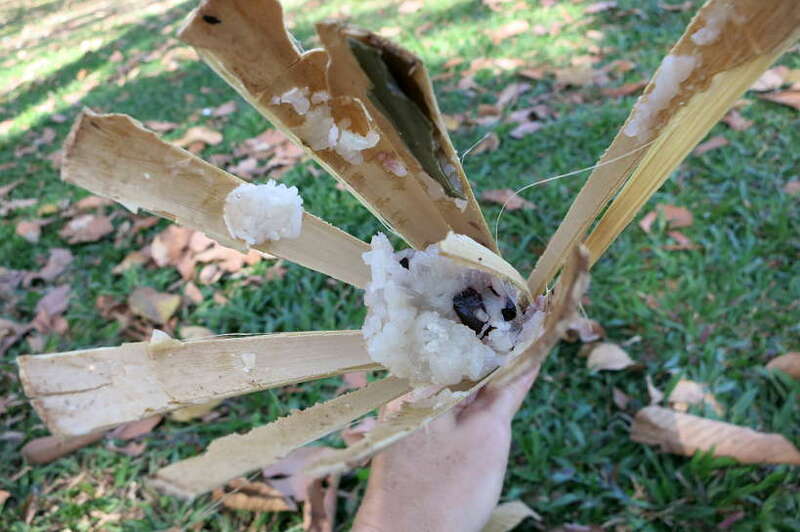 In Cambodia, we learned that the rice used in bamboo sticky rice is a special kind of fragrant rice coming from terraced rice fields of Battambang and Kratie Provinces. The taste is sweet and slightly salty with hints of smokey flavors. Quite delicious and a filling snack any time of the day. The city of Battambang in the Northwest region of the country is popular for bamboo sticky rice. It is Cambodia’s second largest city and a leading rice-producing province in the country. While we didn’t get personally visit the city, the sticky rice from here comes highly recommended as the area is referred to as ‘sticky rice villages’ by locals. 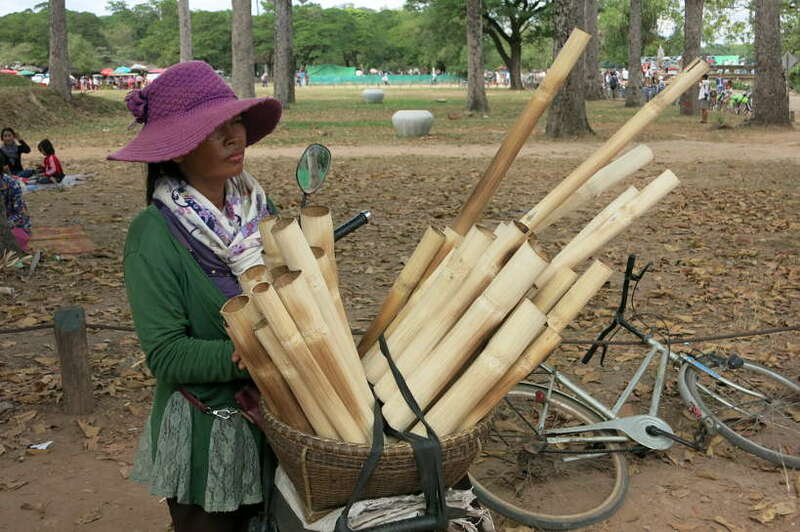 In Siem Reap, around the Angkor Wat World Heritage Site, you will find ladies on bicycles selling bamboo sticky rice. Feel free to approach any one of them and enjoy the sweet roasted dessert. The sticky rice is sold in three sizes, small, medium and large and the costs range from 2000 Riel to 4000 Riel (approx $0.49 USD to $0.98 USD). One of the very first things we noticed when we arrived in Phnom Penh were street vendors with long flat carts on wheels. Their carts are strategically placed under the hot burning sun loaded with freshwater snails. The snails have been seasoned and cooked previously before being dried under the sun. The snails are spiced either with red chili sauce or with garlic and salt. Sold by the bucket or the cup, it makes for an interesting treat to snack on! To eat safely this street food you want to make sure the snail are thoroughly cooked. Try a sample and decide if you ready to indulge for more! You will see plenty of carts loaded up with snails on the streets of Phnom Penh. 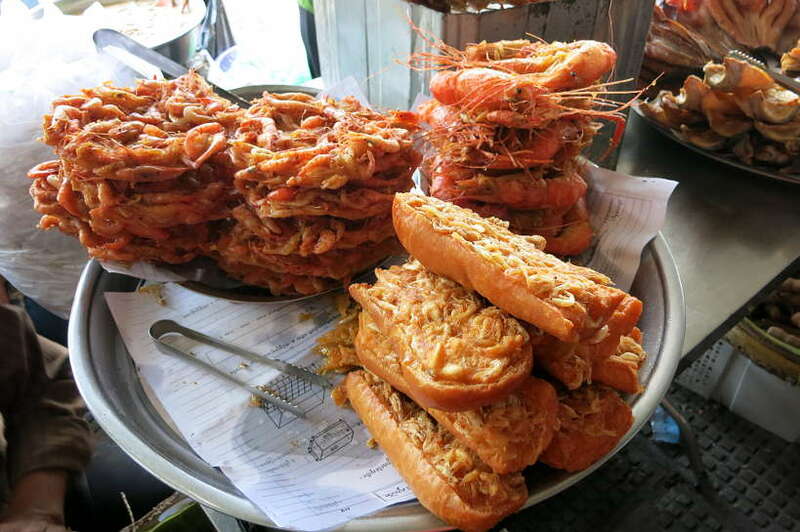 This Cambodian snack appeared to be a much more popular street food in Phnom Penh than in Siem Reap. 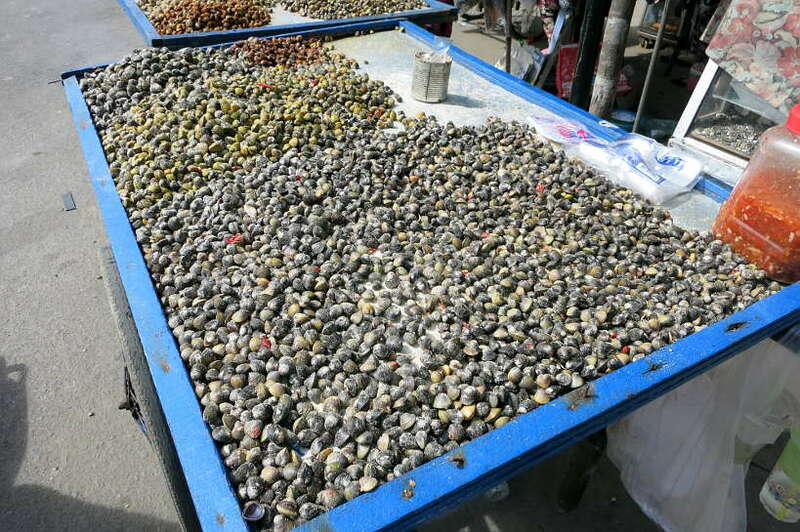 Prices typically run about 2,000 Riel (approx $0.49 USD) per cup of snails. Another way to eat snails is to have it as Amok Chouk. It is a Amok prepared with snails and made with the traditional curry. We didn’t try Amok Chouk, however, if find a good restaurant that serves it please let us know in the comments below! One of the popular Cambodia street foods you will see everywhere are street vendors selling small chive cakes on bicycles. These Cambodian chive cakes are fried in shallow pans, and made with glutinous rice flour and served with a sweet spicy fish sauce. 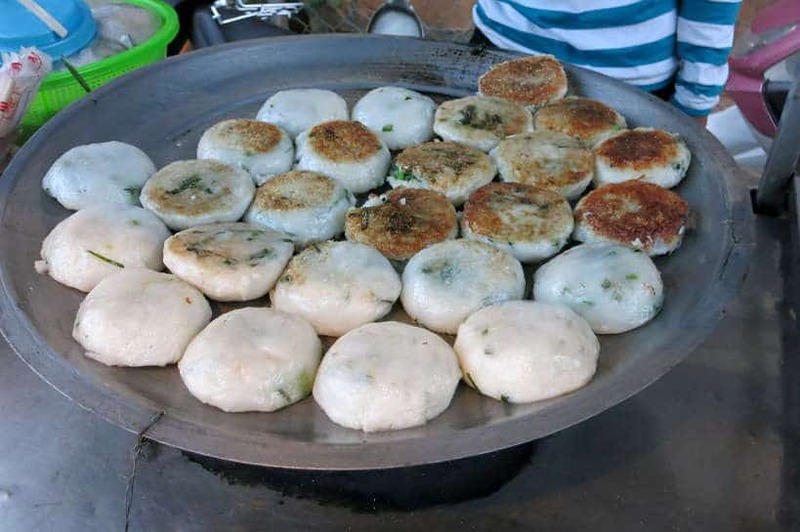 Chive cakes, also known as Num Kachay, are a popular street food in Cambodia, originating from China. While the ingredients are simple, the taste is surprisingly delicious.They are crispy on the outside and chewy on the inside. When dipped into the sweet spicy fish sauce, the flavors blend together perfectly in the mouth. This was one of our favorite Cambodian street food. You will find mobile street vendors with Chives pretty much everywhere. Look for the vendors at busy street corners in the afternoons. You may also find Chive cakes cooking at the local markets. They are sold hot, which reduces the risk of getting sick. And you can buy them by the piece, at about 500 Riel (approx $0.12 USD) per Chive Cake. 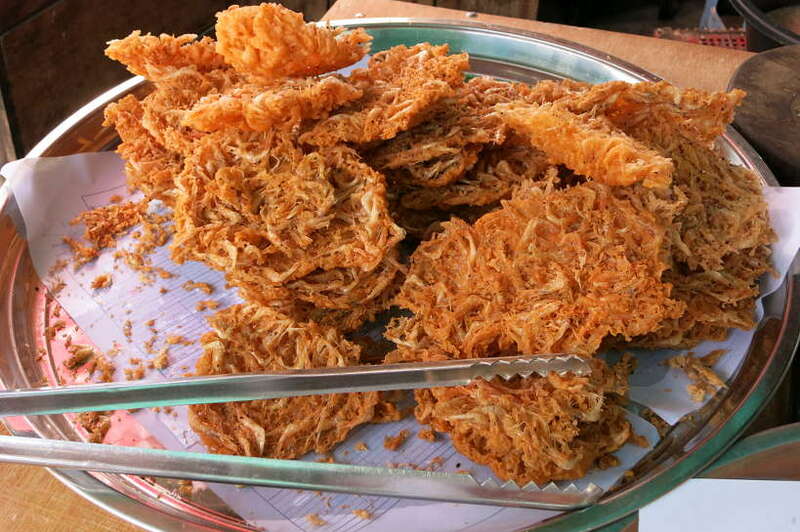 At the local markets in Siem Reap, we were struck by the abundance of fried bread and shrimp cakes. You see vendors at various stalls bending over the hot flames to produce golden, crispy French bread topped with delicious fried shrimp. After being tempted by one particular vendor’s freshly cooked batch, we gave in and bought some to eat for lunch. While we typically do not enjoy fried foods, we surprisingly delighted. The cakes are delicious. And with the bread soaking in the fat, you are left with the taste of perfectly spiced shrimp. After that first tasty experience, we happily bought the shrimp cakes several times again. Look for the friendly ladies with large deep fryers at the outdoor food stalls at the Pho Langka Market in Siem Reap. Get a freshly cooked batch and expect to pay between 500 Riel (aprox $0.12 USD) and 1000 Riel (aprox $0.25 USD) per cake. 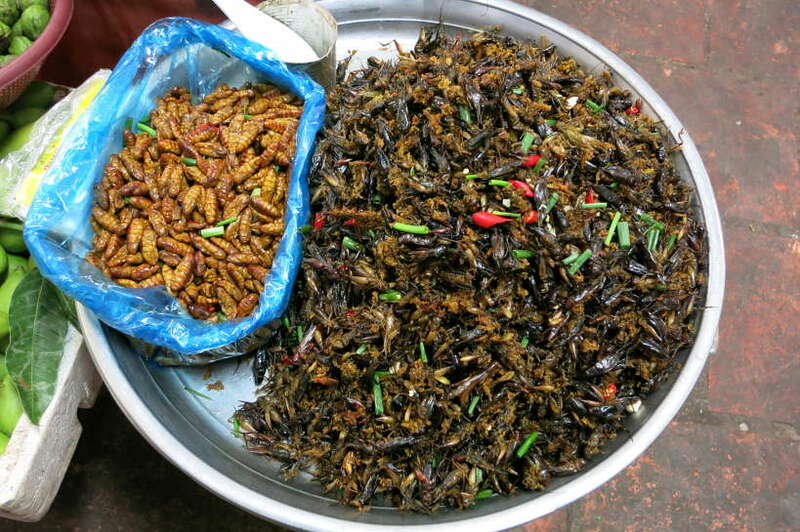 Worms and crickets are probably two of the most popular bugs you will find in Cambodia, in addition to red ants tree. Yes, you will also find edible spiders and scorpions, though these multi-legged arachnids to be more popular amongst tourist than with locals. And to be honest, worms and crickets are far more enticing, in our opinion, to taste than spiders and scorpions. We found the worms to be soft with a slightly crunchy skin and a nice nutty flavor. While the crickets were definitely more crunchy and meatier. Either way, they are a great source of protein and unique and tasty! You will find street vendors selling all different types of insects at the markets. They are typically grilled and sold in large baskets that might contain different types of bugs. Sold by the can or cup, plan to spend about 4,000 Riel (approx $0.98 USD) per can. If eating bugs at the market doesn’t tempt you, you will find restaurants that sell them on their menu. You can find them at Romdeng in Phnom Penh as a snack platter or at Bugs Cafe in Siem Reap. Though obviously, it is not street food anymore. In a previous article, 10 Surprising Facts You Need to Know About Food in Cambodia, anything and everything is grilled in Cambodia. Street food BBQ is quite common and popular. At dusk, vendors pop up around markets and on busy streets, grilling various dishes for dinner time. For seafood BBQ, go for the grilled squid. Served with chili sauce, they are as delightful as they are impressive in size! Walk around any of the local markets past 6:00 pm or after the markets close. You will see many street food carts selling all sorts of BBQ meat and seafood including squids. 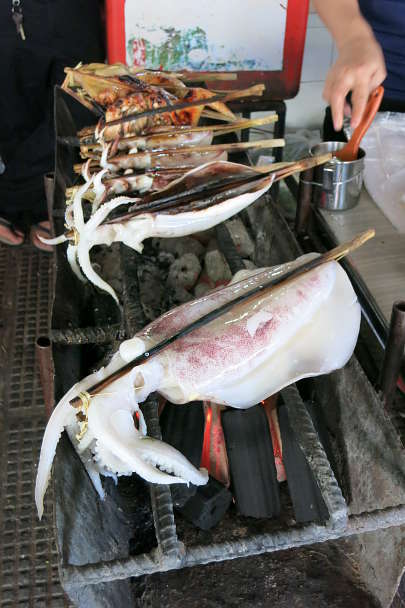 During the day, your best bet for grilled squid is at the markets. 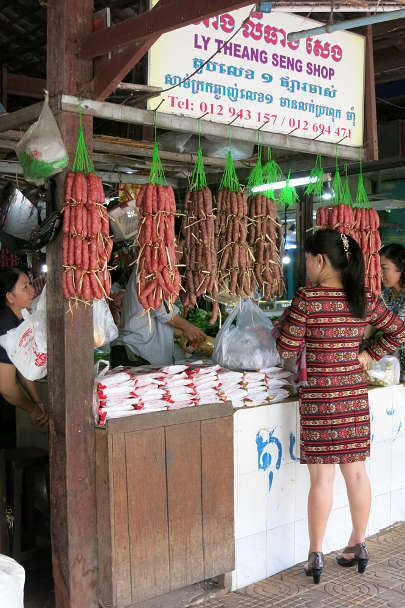 Pork is quite popular in making sweet Khmer sausages known as kwah ko (ត្វារគោ). On street carts around local markets, you will find vendors with different kinds of pork sausages hanging off their carts. The sausages are sold either as skewers or as small sausage balls. After seeing how popular the sausages were with locals, we bought one sausage to try. The red color and the taste surprised us. The sausages are very sweet and quite fatty. 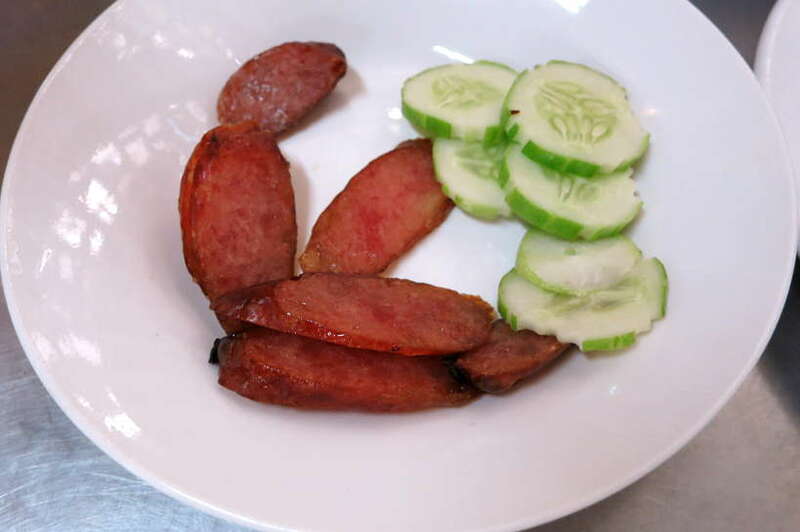 We learned that the sausages are made with palm sugar and composed of half pork and half fat. Personally, we were not fans of the sweet taste of the sausages, however, locals seemed to enjoy them with a cold glass of beer. Look for the market vendors at the local markets. Expect to pay about 500 Riel (approx $0.12 USD) per sausage. 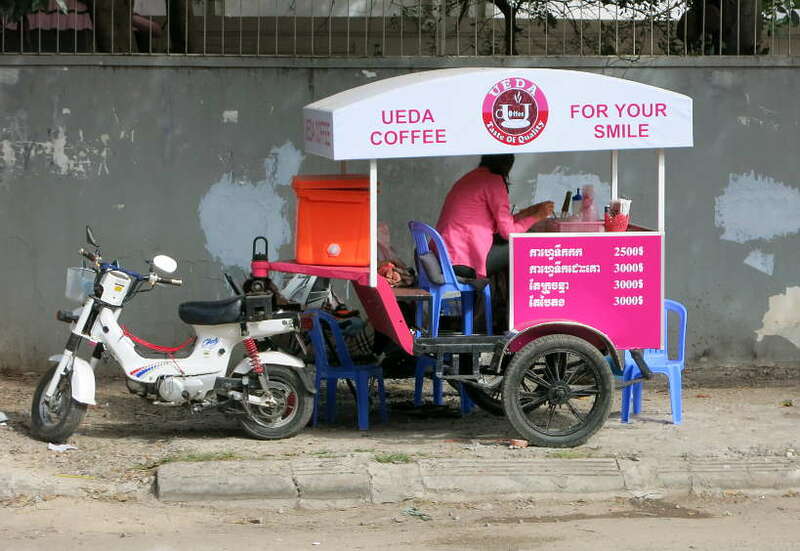 Small coffee carts are a common sight in the Kingdom of Cambodia. The carts are typically sidecars on motorbikes or are pulled by motorcycles or converted tuk-tuks. Iced coffee, or Gah-fay dteuk-gork in Khmer – is a sweet and refreshing popular drink with locals. It is Cambodia’s drip coffee served with condensed milk. Sweet and strong, the coffee can be served black with ice, or with condensed milk for an even sweeter taste. Rosemary, the coffee drinker preferred it with condensed milk. The rapidly melting ice dilutes the strength of the coffee and the sugar making it much more tolerable. During the peak morning hours and after school/work in the afternoons, the coffee carts are visible everywhere. 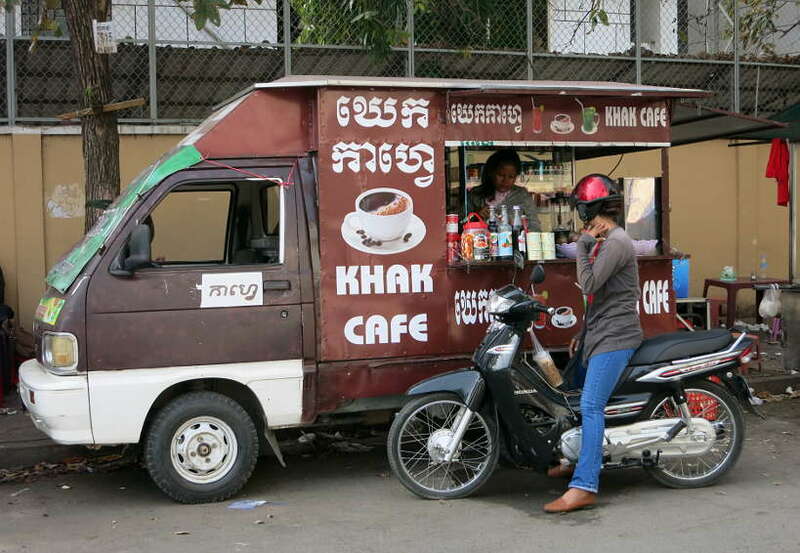 Choose from any street cart and try Cambodian Iced Coffee. This experience will set you back between 2500 – 3000 Riel ($0.62 to $0.74 USD). Cambodian street food is quite diverse and is a gives you a unique perspective into the country’s food culture and delicacies. We found the street food in Cambodia to be much more unusual as compared to the other Southeast Asian countries we had visited (Thailand, Vietnam, Philippines) at that point. With Lort Cha, grilled squid and Num Pang you will find familiar tastes that will delight you. Whether you’re exploring Phnom Penh street food or street food in Siem Reap, the worms, freshwater snails, and bamboo sticky rice will be a way to test your adventurous palate. With Cambodian street food, you are in for a special treat! Have you ever had Cambodian Street food? Which dish would you be tempted to try? If your travels take you to Phom Pehn, take a half-day tour with a local guide and explore Phnom Penh’s markets and street food stalls. If your travels take you to Siem Reap, book an adventurous street food evening tour and discover the surprising Cambodian street foods. If you are interested in learning more about Cambodian Food and Cooking, check out chef Joannès Rivière book: Cambodian Cooking filled with more than 60 authentic recipes. All these look like so tempting. I knew about some Vietnamese dishes to have and have planned a food trail in Vietnam, but thanks to you am going to go on a food trail in Cambodia too. Thats awesome Arnav. Please do let us know if you have any questions as you prepare for your Cambodia food trail. And let us know what you discover and think. Glad the Vietnam and Cambodia resources are helpful. That is our goal with Authentic Food Quest – explore the local flavors! So much of this looks so good. I would love to try the fried shrimp cakes. The stir-fried egg noodles look really good, too. I’m not sure about the snails, crickets, and worms, though. Looks like a great trip! The bugs are snails are certainly not for everyone 🙂 However, they are local specialties coming from a difficult history. You can’t go wrong with the fried shrimp cake, lightly fried and delicious. The stir-fried egg noodles as well. Cheers, Stacey. Love the variety of Cambodian cuisine. I knew very little of the food prior to visiting, but was really blown away with how delicious it was! We tried a variety of street foods, and I really liked the num pang (funny enough, there is a chain of sandwich stores in NYC called Num Pang, which are amazing). I never got tempted to try the crickets or bugs, especially the spiders on a stick I saw at a few markets in Phnom Penh. Sure they taste fine, but have a hard time getting past the fact they are bugs! That’s interesting Drew that there is a num pang in New York 🙂 We need to check that out for ourselves. Agree, the bugs didn’t tempt us either, but we did taste them as part of our quest to discover the local and authentic flavors of Cambodia. No spiders though!! I’m sorry to say but I would not eat worms. Maybe crickets. In fact, I have eaten crickets. But no worms thanks. Surprisingly, Penny, the worms were not as bad as they look. We had them at Marum restaurant and liked the flavors. 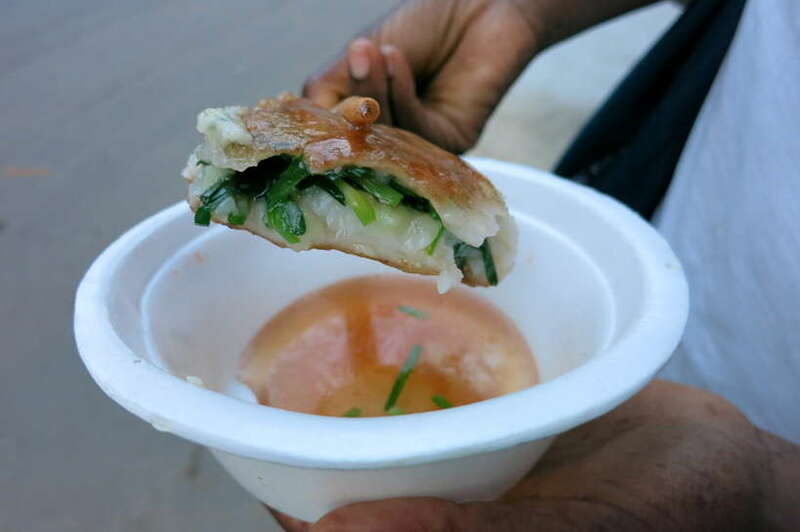 Fortunately, there are many more street foods that don’t involve bugs, and that are worth trying. Thanks for your comments. You make such a great point about Cambodia’s food scene being overshadowed by Thailand and Vietnam. I loved the bamboo rice and the chive cakes while I was in Cambodia. I’d love to try some Lort Cha but I’d need it sans beef, chicken, etc.. As a vegetarian, I found plenty to eat in Cambodia but also found it easier to explain my dietary restrictions in cafes and restaurants than on the street. That’s wonderful to hear Jackie that even as a vegetarian you were able to find to find food in Cambodia. That certainly dispels a myth. Indeed the bamboo rice and chives are easy to eat and delicious! Appreciate your feedback. Thanks for stopping by. How similar are some of these dishes to Filipino street food! Some are similar, but the tastes and flavors are different. Is there any particular one that stood out to you or reminded you of the Philippines? I think I’d stay away from the crickets and worms, but everything else on this list looks yummy. I especially like the look of those chive cakes! Fortunately, Adelina, there is much more than the worms and bugs. Cambodian street food is certainly worth trying!! That’s wonderful to hear Marlo. Use this guide and have a great time. Feel free to reach out with any questions as you prepare for your trip. Where in Cambodia are going? Cheers. Delish stuff! I always recall seeing the tarantulas for tasting when getting off the bus in Siem Reap. Big time snack in those parts. I also recall seeing a huge pig over the spit in PP; at first I swear it was a Great Dane. I am not kidding. Turns out it was pork, although a bit skinny, it was a big pig. My wife and I hit up this awesome vegetarian haunt in town. A handful of blocks away from the river. Green restaurant. I cannot recall the name. So glad Ryan you enjoyed the article. Did you like the tarantulas? Have to admit, we did not have the courage to taste them. Overall the food and street food was quite enjoyable. It’s a shame Cambodian cuisine is not well known….but that’s changing!! Awesome list of street food! I have only tried a few when i was there. I didnt have the chance to try the snails and worms and crickets. Will remember these for when I come back! When were you Cambodia? Did you enjoy the food scene? Do you remember which street foods you enjoyed? Certainly, a trip back is required. A country rich in history, filled with warm locals and an emerging culinary scene. Thanks for stopping by. You are real food explorers! I don’t have fond memories of food in Cambodia, probably because I did not go deep into Cambodian cuisine like you say. Actually I don’t remember to have seen any of your proposals, too bad! It’s too bad you missed out on the delicious and unique local specialties in Cambodia. It’s true you do have to seek out the local gems, but when you find them, you get to really appreciate and taste the local culture. Perhaps another trip in the future? And with our guide 🙂 Thanks Elisa. I wish I had this guide before I went to Cambodia. 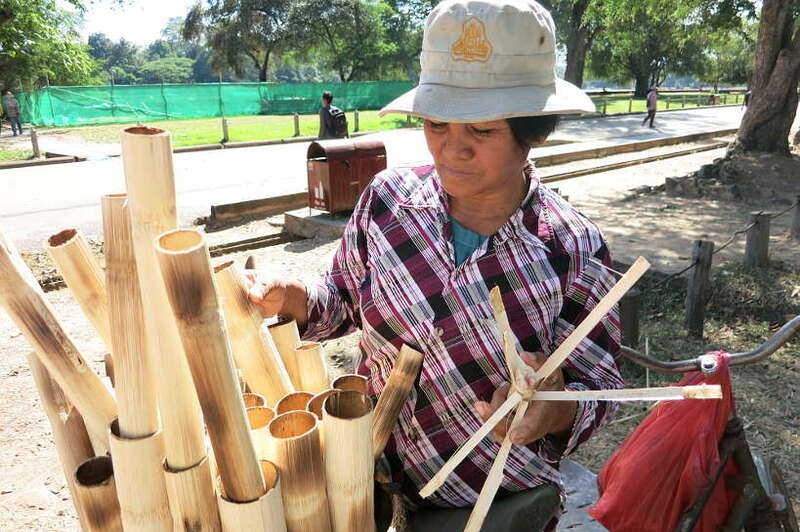 I missed out on so many of these awesome delicacies–I wondered what the ladies on the bicycles were selling in Siem Reap and had no idea it was bamboo sticky rice. I would have loved to try it. I have to admit, I had plenty of chances to try worms and crickets, but I couldn’t bring myself to do it–maybe one day! Thanks for the great post! Oh wow, so you did see the ladies in Siem Reap…it’s too bad you missed out on trying the bamboo sticky rice. That would have been such an experience. Glad you like the guide and do hold onto it for your next trip. Cheers! I love tasting street food wherever I travel. Cambodian street food seems finger-licking! Great comment..lol…the street food is certainly finger-licking good..especially with all the BBQ served on skewers. Absolutely worth exploring!!! Nothing special compared to Thai food which is a lot better and offers so many more dishes. That’s amazing that you lived in Cambodia. What island? For how long? That must have been an amazing adventure. True, the street food we found was mainly in Phnom Penh and Siem Reap. You are right, heavy protein and limited vegetarian options, though the Lort Cha is good option. Glad you found the tips helpful. Having recently enjoyed my first street-food heavy holiday (to Thailand) I’m very keen to see and eat more of South East Asia and Cambodia is very much on the list. 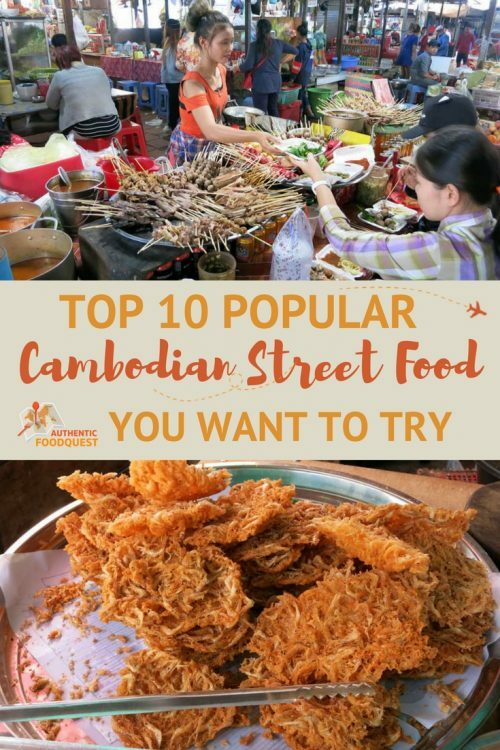 Loved reading about popular street food items, I’m particularly keen to try bamboo sticky rice and chive cakes and deep fried shrimp cakes but I’d love to try all ten! That’s wonderful that you enjoyed your Bangkok street food experience. It’s truly the street food mecca with amazing food everywhere. 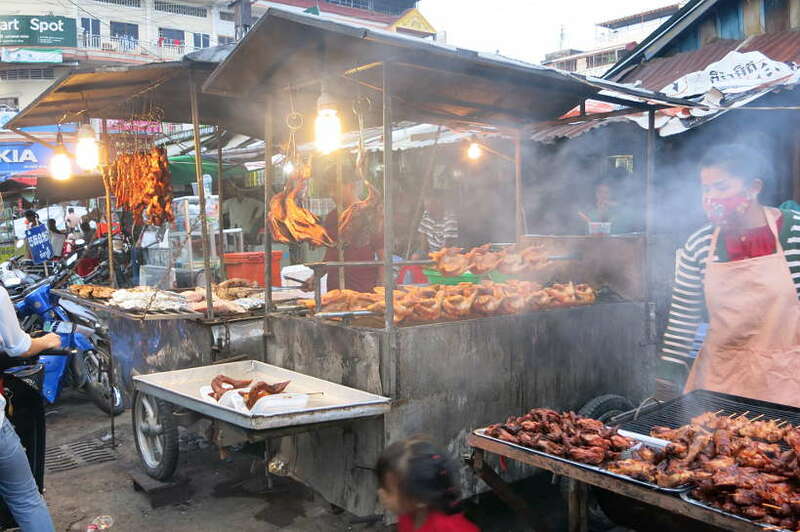 The street food in Cambodia is different but full of its own local flavors. It’s worth trying all 10, but the ones you mentioned are a good way to get started. Thanks for stopping by Kavita. As I read through I kept thinking “I want that” than i got to the worms, crickets and squid and you lost me. I’m a wimp. But I am all about the Nompang sandwich, bamboo sticky rice, chive cakes and that fried shrimp! Not everything in Cambodia is for everyone. That’s for sure…Eating what you can like the sandwiches, shrimp, chives cakes and sticky rice is still a wonderful introduction to the local flavors. Hope you get to Cambodia soon to experience the food. Thanks, Sherianne! The Lort Cha dish looks amazing and I do like escargots, so I’m wondering if I’d also enjoy the snails? I’d at least be willing to try some of these foods! The lort cha dish looks great and tastes amazing. You would love it. 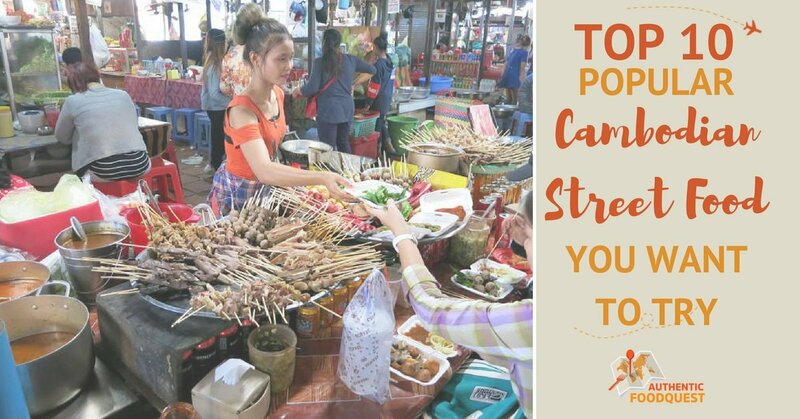 Not everything on this list is for everyone, but even a taste of just one Cambodian street food will give you a glimpse into the local culture 🙂 Thanks, Tami. Awesome and so glad that you also love exploring the local cuisine. Hold onto this article and take it with you to Cambodia. With the directions given, you’ll be in for an amazing time in Cambodia. Thanks, Medha for stopping by! This is probably not a good article to read when I am hungry. The description of Lort Cha sounds so good my stomach literally rumbled while reading it. I am not brave enough to try the cooked snail, but I know my son would because he is the adventurous eater. From seafood to insects, I would agree with you that Cambodia is diverse. There is never a good time to read about food 🙂 The Lort Cha is amazing and quite tasty. 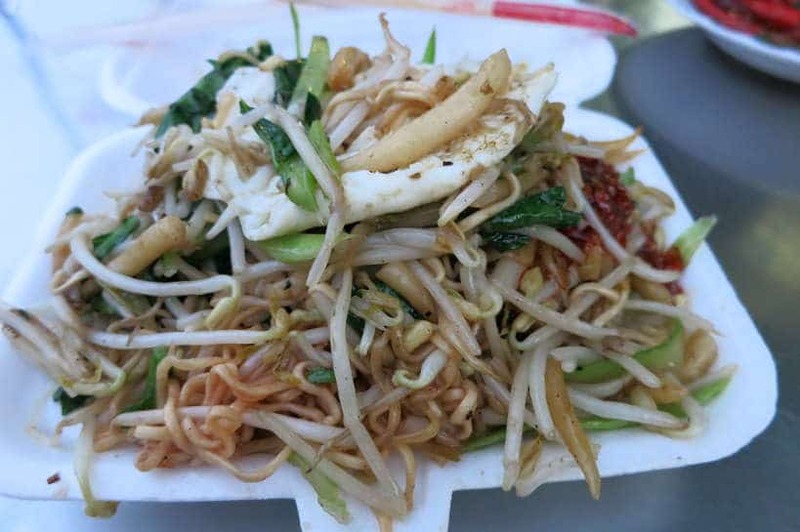 Not everything is for everyone from this list of popular Cambodian street food dishes. A little bite of whatever dish is a bite into the local culture. Thanks, Chris for stopping by. Wow! That’s a nice list. We once found a whole cow or a buffalo or something on bar-be-cue. Wow, that’s incredible that you found a cow or buffalo. So many strange things grilling on the streets of Cambodia. We once saw a dog! Frightening! Indeed, picking up a few local words go a long way 🙂 Thanks Nisha for stopping by. I enjoy trying out the local flavors wherever I go and a post like this is just the perfect reckoner for figuring out where to get the best. Cambodia does seem to have a lot of choice for non vegetarians but the few that I saw for me, are quite interesting. Like the Bamboo sticky rice. I definitely would want to see how different it is from the Thai one. There are loads of street food options in Cambodia. The bamboo sticky rice was certainly quite interesting. We had previously eaten it in Thailand and were also quite curious about the taste differences. Quite interestingly, there is a difference in taste. Perhaps the rice or different kinds sesame used. Either way, quite tasty and an experience not to miss. Cheers. I don’t know much about Cambodian cuisine or Cambodian street food, but I have to say after reading this I definitely want to try more! It looks delicious. I love the idea of the Num Pang (and the introduction of the baguette) and I’d give Chive cakes a go when I’m on the move! Awesome to hear that you got some insights into Cambodian street food. Those are definitively two great choices to begin with, but don’t hesitate venturing out further 🙂 Thanks Samantha for stopping by!! Street food is a window to the culture of a place. Getting to eat street food is a great way to get a slice of the local life of the region. The street food in Cambodia seems to have a vast range of items. Being vegetarian, probably our choices are limited but I am sure we would enjoy veg noodles or veg rice. One thing I thought was something we would love is the Bamboo sticky rice. The way it is served looks so fascinating. You are right Sandy, when you taste the local street food, you bite into the local culture. We found a lot of meat-based options, but vegeterian options do also exist. The bamboo sticky rice is quite tasty and the lort cha and chive cakes are also not be missed. So glad you enjoyed the article!! Planning a South East Asia trip in 2019… I really enjoyed your article and I am saving it to my SouthEast Asia Pinterest page lol! 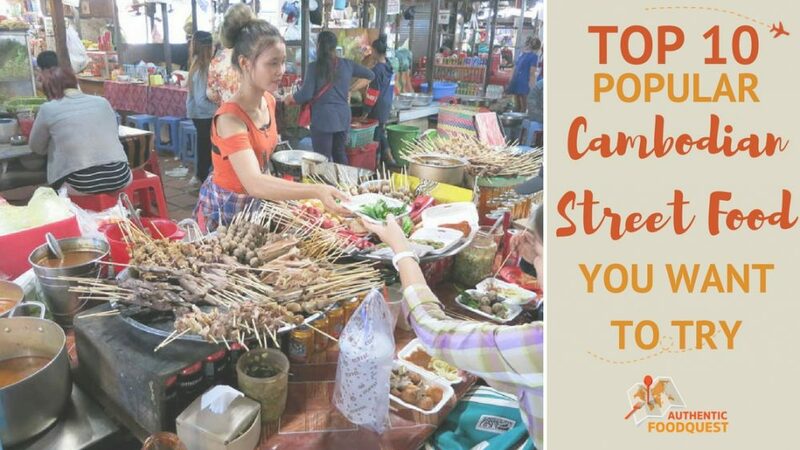 I would try everything on this list without exception… and I hope to find even more amazing street foods on my journey! Thanks! You are most welcome Michelle. You will love the diversity of food in South East Asia. What countries are you planning on visiting? Feel free to reach out with any questions as you prepare for your trip. Thanks for stopping by! That all looks delicious! We are flying to Phnom Penh next week to meet our son and his girlfriend then traveling to Kampot where we hope to try some pepper crab, Koh Rong Sanloem and then Siem Reap. I was curious about iced coffee, is it safe to drink with ice I assume is made with local water? Thanks for your information! i was tryin for sandwich khmer .. and no one sandwich in this world is better than cambodian sandwich street food. two thumbs up !! 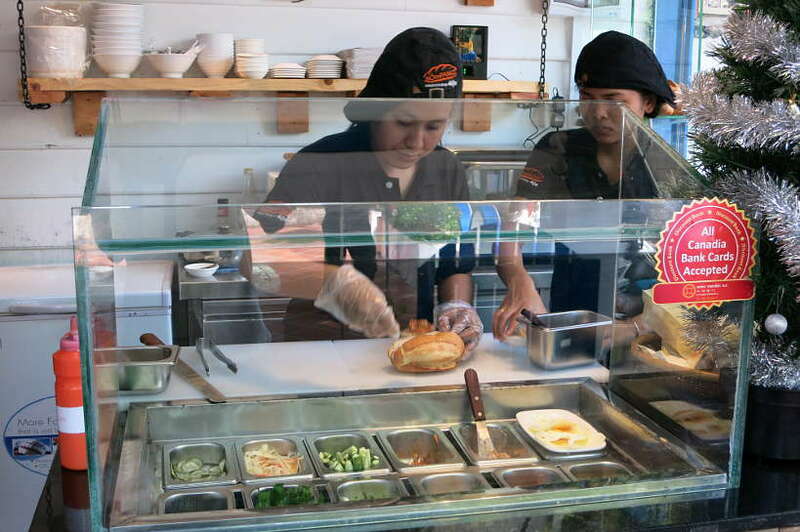 Great to hear Rachel… the Khmer Sandwich is indeed delicious. Cheers.